One of my friends has been insistently telling me to post a peanut butter recipe but with a twist and whilst I love peanut butter I've never made my own before so I had no idea where to start but I managed to get it done. I saw a branded salted caramel peanut butter (obvs an American brand that isn't in the UK- double obvs!) and that had my name written all over it. ALL OVER. I started considering making a homemade version but then the issue of shelf-life started to nag at me because caramel involves some variation of milk so I had to kill that idea pretty quickly(for the time being)! 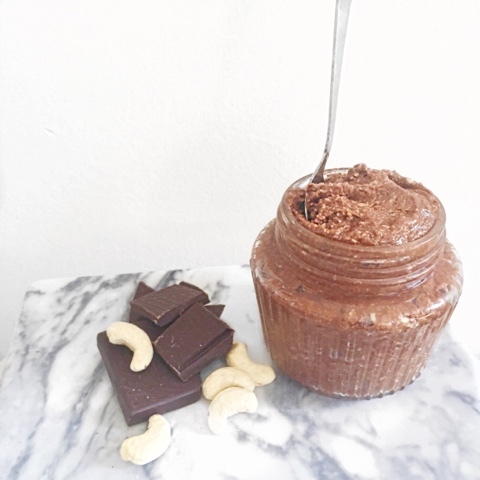 Instead, I made this chocolate flavored peanut butter which is seriously delicious and addictive. I've been eating it on its own and with apples(sometimes). Before I made this, I read a zillion (maybe like 5) different articles of tips to making peanut butter so I thought I was prepared for the process - I wasn't. I panicked at least twice; when the nut powder was just clumping together (1 minute into it) and then what if the chocolate didn't melt as I thought it would? If these things happen to you, do not panic. 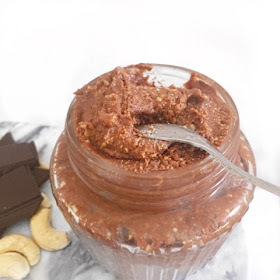 With only 5 ingredients this peanut butter is super easy to make and I'm now wondering why I hadn't made it before? If this is going to be your first attempt at peanut butter do not expect it to be Skippy style peanut butter, its more 'rustic' than that but tastes waaaaaaaaaay better. 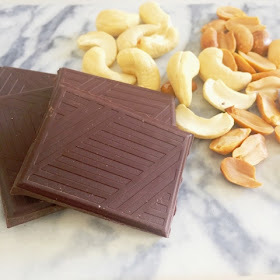 I made mine with a mixture of peanuts and cashews but you could do just one type of nut if you prefer.